AMETEK Process Instruments is a worldwide manufacturer of process analyzers and instrumentation. A Business Unit of the Process & Analytical Instruments division of AMETEK, Inc., we are part of a global corporation with over $3.8 billion (USD) in annual revenue. Our engineering and manufacturing activities take place in several North American facilities. We have direct sales and service offices scattered around the globe, as well as a wide network of factory-trained manufacturer’s representatives, distributors, and service technicians. At AMETEK Process Instruments, we focus our experience on designing new, innovative analyzers that help our customers achieve higher levels of productivity and quality. We do this by seeking out ways to overcome the limitations of current methods of process monitoring, control, and quality assurance. It is through this focus that we have created some of the most unique and capable technologies in the world. Our primary focus in analyzer design is reliability. We understand that you must have confidence that the analyzer will provide the correct information when you need it. It is a documented fact that many of our analyzers have been in service for well over 20 years. At AMETEK Process Instruments, we understand that no single solution is applicable to all applications or processes. We maintain the capability to understand and evaluate your unique needs and applications. If a pre-engineered solution does not meet your needs, we will custom-design a solution for you based upon one of our unique technologies. We pride ourselves on our ability, and willingness, to produce unique analyzers and solutions for our customers. We routinely design and manufacture sample handling and conditioning systems for use with our analyzers. In addition, we design cabinets and shelters to meet any environmental concerns or considerations. 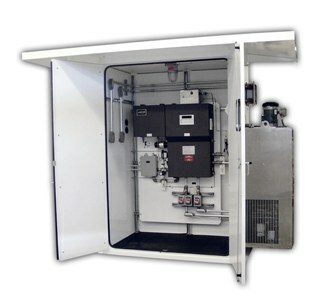 We have done it all from a simple instrument to a million dollar, multi-analyzer shelter for use in hazardous locations. Our customer commitment continues well beyond start-up and commissioning of the analyzers. AMETEK Process Instruments has over 100 factory-trained service technicians worldwide to support our customers' needs. Moreover, we offer a wide variety of service plans to meet their needs. AMETEK Service Assistance Program (ASAP) plans range from pre-paid routine maintenance visits, to 24 hour per day 365 day per year phone support, to 24 hour on-site support for emergency service visits. We have the commitment and the resources necessary to support our customers anywhere in the world. You can find more information about our service and training capabilities within the Service section of this web site. AMETEK Process Instruments provides integrated analytical measurement systems for a variety of industries each with its own specific requirements. We have system integration production capabilities at our Calgary, Newark and Pittsburgh facilities. Factory acceptance tests (FAT) for a comprehensive scope of analysers can be supported from any one of our locations. 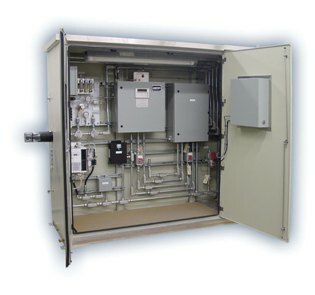 Analyzer integration requirements for HPC applications varies from simple weather protection for a close coupled analyzer, to wall hung or ground mounted cabinets, to full walk in analyzer houses with HVAC and fire & gas systems. AMETEK Process Instruments manufactures according to NEC, IEC, ATEX and GOST hazardous protection area codes depending on end use country and customer requirements. AMETEK Process Instruments specializes in sulfur recovery applications where analyzer system design cannot be left to chance or standard design, the system is delivered with a single guarantee from sample tap to output. AMETEK integrates third party analyzers from a variety of analyzer suppliers. Natural gas quality monitoring frequently requires analysis of more than one impurity. AMETEK offers standard, as well as custom designed combinations of analysers and provides convenient turnkey packages. 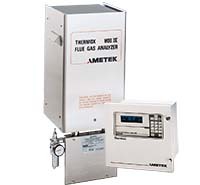 A typical natural gas quality measurement package includes hydrocarbon dew point (Model 241CE II), moisture (Model 5100 TDLAS or Model 3050) and H2S (Model 933) monitoring equipment. 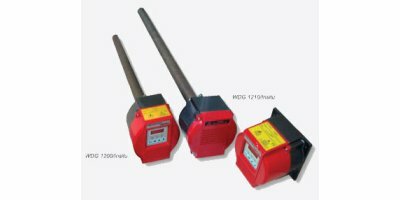 An example of specific custom solutions is a multi-point moisture analyzer system using our QCM or TDLAS analyzers for gas dehydration control. A global network of trained and experienced AMETEK service staff are available for commissioning and training to ensure a successful start up of all AMETEK supplied equipment. Engineered solutions for Continuous Emission Monitoring systems (CEMs) process and environmental monitoring. Multi component systems, extractive dry-dilution, extractive hot-wet, mass emission, rack mounted, wall mounted, hazardous area or general purpose. AMETEK has experience with many application specific CEMs for sulfur recovery, tail gas clean up, residual H2S in stack gas, sulfuric acid mist and non contact O2 for wet or corrosive streams. Semiconductor and UHP gas applications are another world as compared to any other application. The challenges include; maintaining sample integrity, reducing contamination, increasing speed of response and validation at single digit to sub ppb levels. AMETEK Process Instruments manufactures a wide variety of UHP analysers that measure trace impurities like HC, CO, CO2, H2, moisture and O2 as well as residual gas analyzers (RGA). AMETEK Process Instruments can provide full integration for both mobile and fixed systems in any combination in standard packages or customized configurations. Pharmaceutical and Biotech unit operations require that measurements be taken over a wide range of pressures and temperatures. AMETEK has designed specific inlet systems for the both the manufacturing floor and the research lab. We can arrange for complete installations including heated sample lines or work with third party contractors to make installation as smooth as possible. Availability of IQ/OQ documentation ensures a trouble-free validation process.